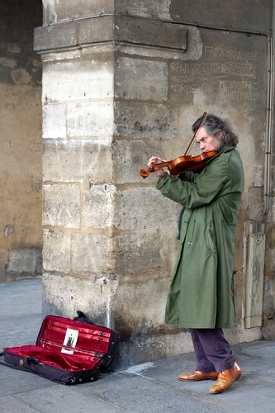 You never know what you’ll stumble upon while wandering the streets of Paris with camera in hand. Hopefully a good picture, but more important, some great memories. 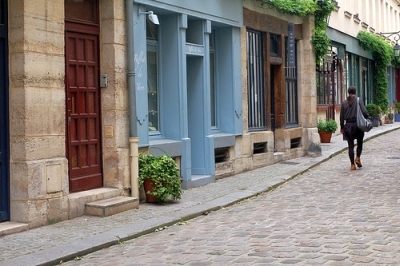 Sophie pushed open an anonymous door on rue de Faubourg Saint Antoine and we stepped off the noisy street and into a peaceful, shaded alley leading into a Parisian courtyard that seemed to be from another century. I followed her, still a little flabbergasted at the nonchalance with which she strode right in. This was not the Paris I knew, the Paris of landmarks and elbow to elbow tourists. And that’s exactly what I hoped for when I booked my half-day photography workshop with Sophie Pasquet. We have to back up for a moment. I’d decided with three weeks notice to visit Morocco, and limited by my miles as to where Delta could fly me, I had to fly into London and EasyJet it to Marrakech. When the agent asked where I’d like to fly home from, well, the answer was a no-brainer: Paris. Though I’ve visited the city half a dozen times — spending a week there just last year — I can never get enough, and took this opportunity to tack on a couple days in my favorite city. Once the decision was made, I began to wonder how to fill my time on this, my first trip to Paris all alone. Of course I’ve visited the biggies, and even some of the more obscure sights (5 a.m. tour of Rungis anyone?). I’ve taken a biking tour, a Seine tour, walking tours and even a boulangerie tour. How might I see the city in a new way? Well I’m an enthusiastic photographer, and I love capturing images of food, street scenes and architecture in Paris. I also know very little about the workings of my trusty Nikon D50, shooting using an automatic most of the time. So I decided to book myself into a photography workshop. I asked my friends for recommendations and searched online. The first one I found cost a thousand bucks for a day (that was my entire Morocco budget), and the second promised to teach me how to use Photoshop (umm, been there, done that, I wanted to learn to take pictures right the first time.) Then I found Sophie, with relatively reasonable prices and a professional, attractive website (yes, I judge on that). Happily for me she was available on my one full day in Paris, and I booked a four-hour, 150-euro workshop right away. She asked me to send eight photos that I’ve taken for critique, and planned an itinerary for our four hours that would fit in all of my interests. “It looks like you have a good eye and you are not afraid of getting up early to get good pictures,” she said in an e-mail. So she planned a rendezvous at 8 a.m. at Marche d’Aligre, a street market in the 12th arrondisement, thankfully not overrun with tourists. We could start at the Marché Aligre in the 12th arrondissement . . . We could then move on towards the Faubourg St Antoine known for its many old traditional wood furniture “artisans” (way before Ikea was invented!). We will find small alleys and courtyards that will make us feel like we stepped back in time . . . This is the old Paris tourists don’t get to see very much! Then we could move on to Place de la Bastille and continue our walk in the Marais district for some classic architecture and street scenes. Along the way we will stop in a little café and will review the pictures you sent. Sophie sent a nice PDF document with tips and tricks for photography, illustrated with gorgeous shots of Paris. I printed the map she sent with clear directions to meet her, and promptly stopped thinking about Paris — Morocco beckoned. After my North African adventures was through, my excitement for the workshop renewed. I arose early to the rumble of trains at Gare de l‘Est outside my hotel and took the metro to the 12th. Arriving early, I wandered the market as the vendors unloaded and stepped into a small bar for coffee. As I sipped my much-needed café crème, I looked around and noticed everyone was drinking wine. It was 7:45 a.m. Perhaps they’d been up all night taking delivery of the produce and seafood now going up for sale outside. I found the corner where I was meant to meet Sophie, and just as it turned eight I saw a friendly face. In perfect English she asked if I were Dana. After exchanging cordialities we got right down to work. The market was open for business and we strolled down the street, chatting about photography. 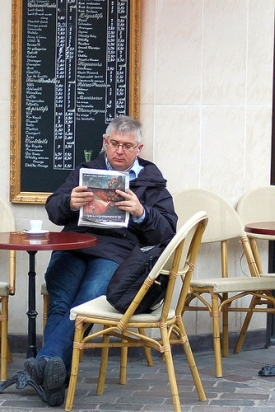 I noticed a man sitting outside a bar drinking espresso, reading the paper and listening to his iPod. What a fantastically quintessential Parisian scene for the times. “That can be your first photo,” Sophie urged. Stealthily I walked by, looking through my camera as if interested in a street sign. Click! I captured him and ran to show Sophie. As we walked among the produce stalls she coached me. “Anticipate the image,” she advised. “If you see a customer at a stall, be ready for them to hand money to the merchant and take their food. Have the camera ready.” I practiced adjusting speed and exposure on fruits and vegetables, occasionally getting up the nerve to snap a customer or vendor. All around me a day in the life of a Parisian unfolded, scenes unremarkable to those shopping and selling, but experiences that I wanted to hold on to — exactly why I was taking this workshop. After I’d taken sufficient photos of potatoes, carrots and artichokes, we made our way to a small café where I enjoyed my second coffee of the morning and a flaky croissant. Sophie pulled up the photos I’d sent earlier on her iPhone and critiqued each one — a surprisingly helpful exercise. Restored with the caffeine and breakfast, we set out for the Bastille area. Along the way we stepped in and out of the busy boulevard and into quiet alleys and courtyards made up of apartments and artisan shops. It would never have occurred to me to just open these doors and stroll right in. We visited one courtyard of apartments that used to be a factory. It was a different world in here, with a kitty fast asleep in a bicycle basket. I clicked away, getting feedback and suggestions from Sophie at every step. With her input I began to study the scene more carefully and really notice (and appreciate) what I was looking at. These ordinary scenes represented some of the magical allure of Paris: a bike leaning against stairs, flowers cascading out of window boxes. It’s not just the blockbuster sights that make Paris what it is. We continued on past the Bastille and into le Marais, a centuries-old village just pleading for a cocked-and-ready camera. We veered from busy main streets and onto tiny little streets tucked away behind doors or just hiding in plain sight — that is, until you really begin to look around you. I continued my photo spree, working on a violinist in Place des Vosges, archways, lampposts, café tables and beguiling street scenes like that of Rue de Tresor. The cathedral bells around the city soon announced (along with my stomach) that noon had arrived. Sophie and I parked ourselves on a bench for a review. At her request, I wrote five things about photography I’d learned that morning on a notecard — a good idea since I was in such a rush to get back out and take more photos that I’d never have stopped to write them down myself. We parted with a hug and promises to send photos and I set back out, camera in tow, ready to capture my own secret side of Paris.